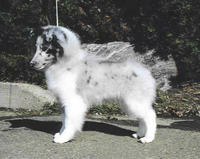 While any record can be added to a local database, the specific information in the record cannot be edited unless it is owned by the kennel. 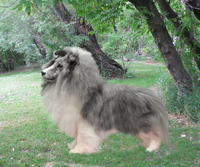 Regardless of ownership, a profile complete with photos can be created and featured on your site. This is useful if you wish to display photos, information, and pedigree for a dam or sire of one of your own animals but at the same time it protects the valuable (and likely static) information in the master database. If you require changes to be made to a locked profile, please contact the site administrator. 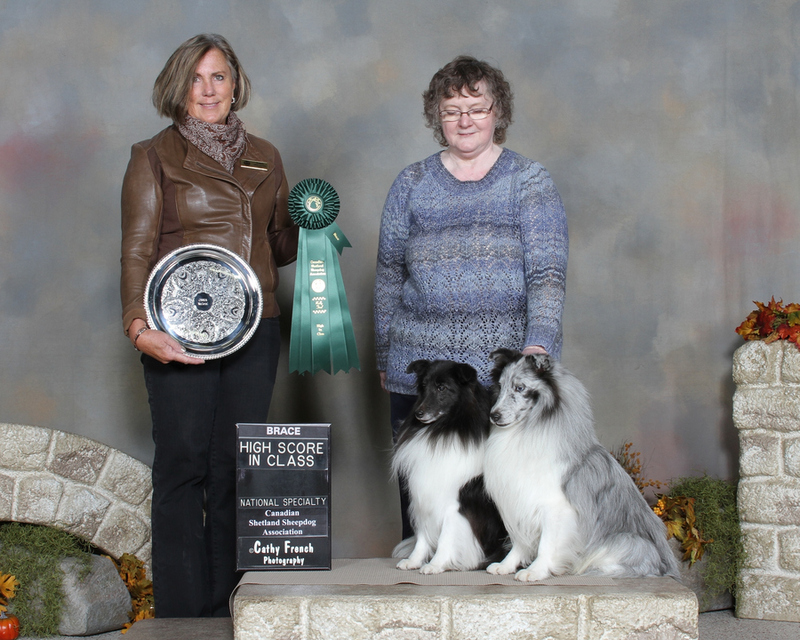 Morgan and son Dusty - high in class rally brace at CSSA National October 2016! 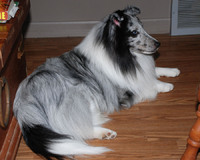 Dusty is nearly 10, and his mom is 12 1/2 years old. So proud of my oldies. 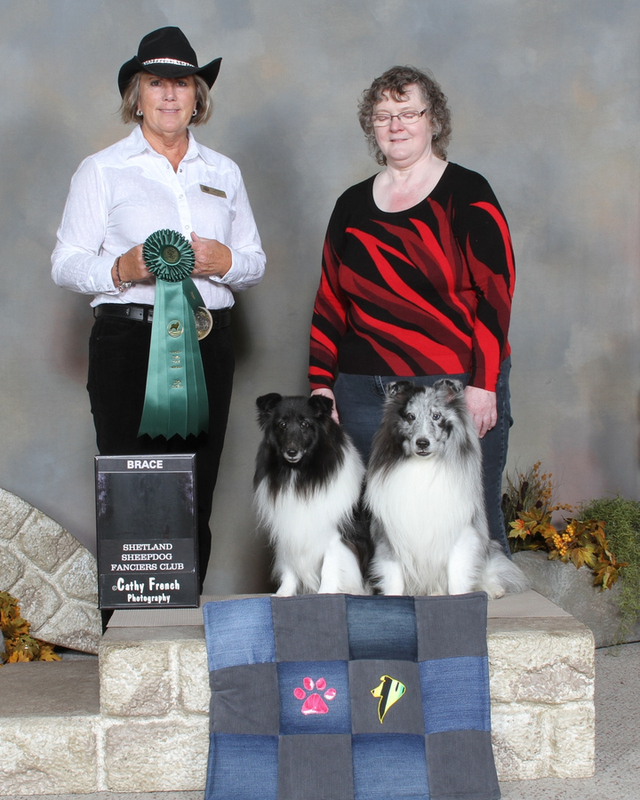 Morgan & Dusty, obedience brace, and both qualified in Veterans obedience, October 2016. Thanks to Charlene Lang for helping with Veterans sits & downs, and this picture. Morgan & Dusty, rally brace, SSFC October 2016. Thank you, judge Susan Des Cotes, for our perfect score of 100! Dusty was the demo dog at SSFC's grooming seminar - thanks Tracy Robinson! 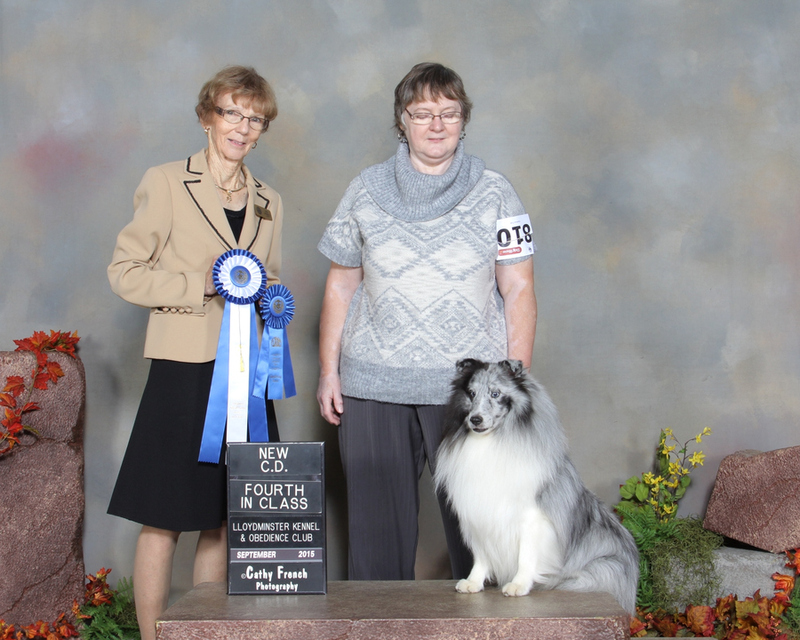 Dusty earn his 3rd title in 6 weeks - CD September 27, 2015; RN October 23, 2015; and RA November 6, 2015. 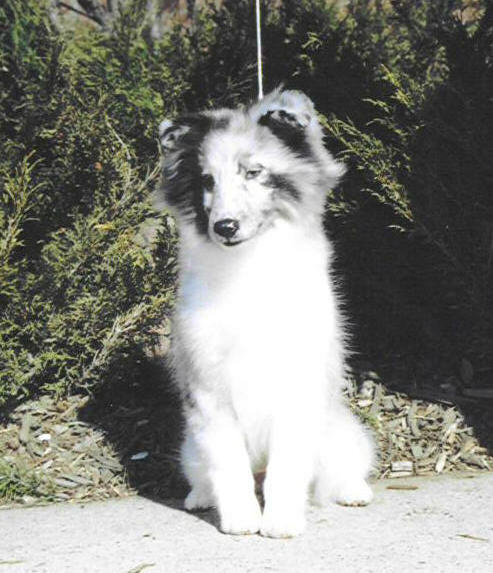 Nearly 9 years old and as peppy as ever! 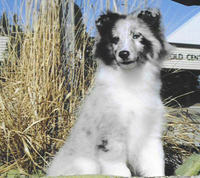 Dusty is proudly co-bred and co-owned with Pam Cazes, Kimicko (Perm. Reg'd.) 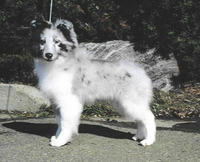 Shelties. 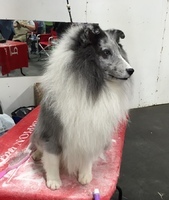 Dusty earned his first 8 points from the Junior Puppy class, and his finishing points at 10 months - always groomed and sometimes handled by Carol, often handled by Karen Chant, and handled to his finishing points by Kathy Charlton - thanks, Karen & Kathy!!! 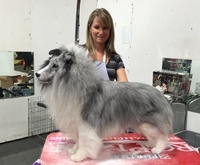 Dusty finished at the last Working-Herding Dog Association of Alberta Specialty under Sheltie breeder-judge Leslie Rogers - we are thrilled with our baby boy. 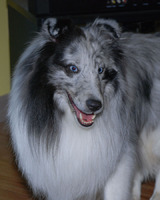 Dusty is the first biblue for Liska. 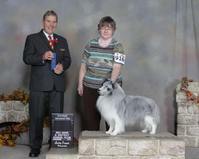 Dusty is learning the "performance" stuff, and now sports his first two titles. 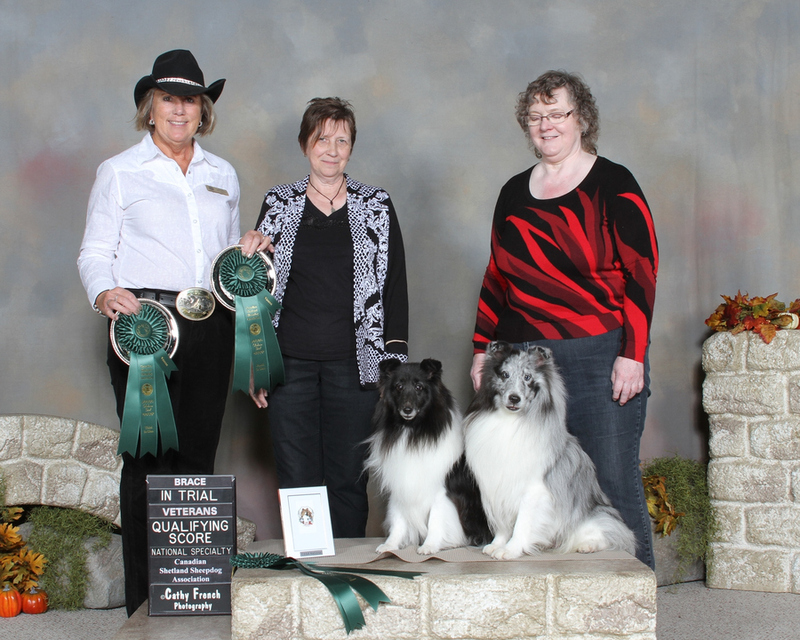 He earned his pre-companion dog (PCD) 3 straight at Camrose March 2013. 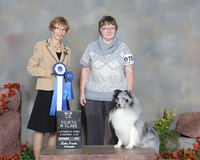 And he earned his canine good neighbour (CGN) last year at NACA. Once I get my second new knee and recuperate from that, we'll be working on more of the brainy stuff for our boy! 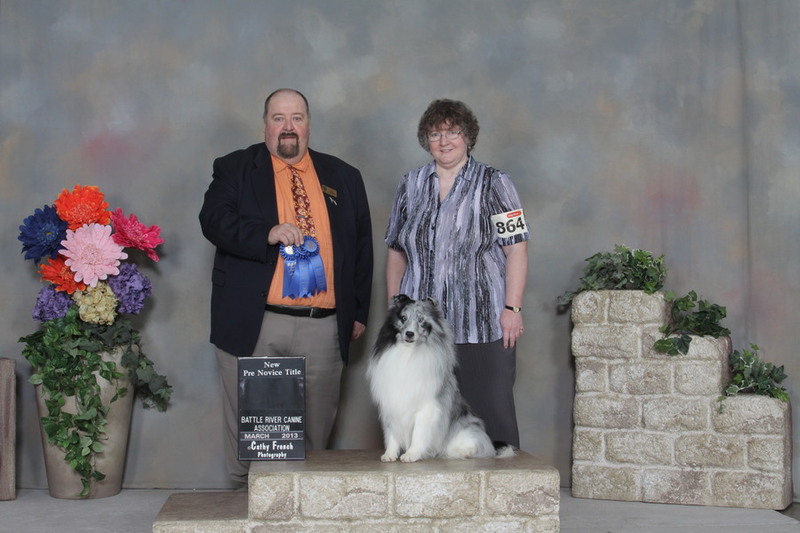 Dusty earns his CD in 3 straight trials including a 4th in Class and a 2nd in Class. Lloydminster Sept. 26-27/15. 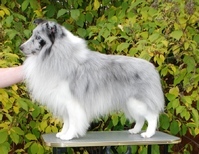 Dusty salutes his sire, BIS/BISS Am.Ch. 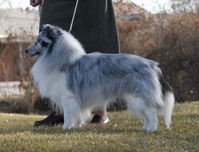 Sea Haven Chasing Moonbeams, ROM, CC, on winning Best of Breed at the ASSA National specialty 2011 - defeating approximately 700 Shelties - we are so thrilled! 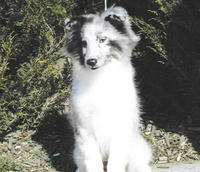 Pictured at 4 months - Clare Belanger photo. All titles Canadian unless otherwise noted.